At almost 11 pm on Sunday, I received a private message from my Facebook friend. I was already in bed, but responded to the 'message received' alert on my smartphone. My friend asked me if I was aware of anything happening around Tekka market area, that he is hearing that the police's elite tactical units are all over that area. 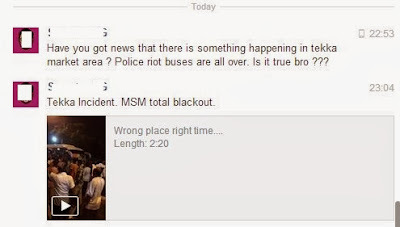 A few minutes later and before I could respond, this friend sent me another message with a video of the riot, lamenting that there was total blackout at that time in the mainstream media. I couldn't believe what I was seeing on the video my friend had sent me. Was this really happening in Singapore? I tried to look at the license plate of the bus, the surrounding environment, all to try and convince myself that this was not happening in Singapore. But I couldn't. I looked at the newsfeed on my Facebook - sure there were lots of chatter of a riot happening in Little India, but all were from FB friends, and none were from the mainstream media. Then, at a little past 11 pm, The Online Citizen put their boots on the ground to report the riot. Soon after, the mainstream media started carrying news of this riot. This is one reason why it is unreasonable for the Government and the mainstream media (through its commentaries and forum letters), to constantly berate the alternative media for propagating lies, half-truths and misinformation. Of course some were asking questions like if it is true that policemen had died in the riot on social media - questions which could raise the anxiety-level of the public over the incident. But people were asking such questions only because there was apparently no timely announcement by the Government and the mainstream media to provide more accurate information on the riot. A near-riot involving 200 hostile mob and 4 policemen reportedly happened in 2008 (link: Red light area gets out of line). 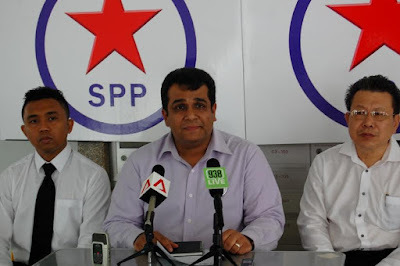 The story was been given a wide berth by the mainstream papers and only emerged as a result of a district court sentencing report in the year 2010. One can only wonder if the mainstream media would have conveniently given the Little India Riot a wide berth as well had it not been for the social media and the bloggers.